Crochet a granny square mug cosie and some super simple crochet wristies with fluph in Dundee, Scotland. 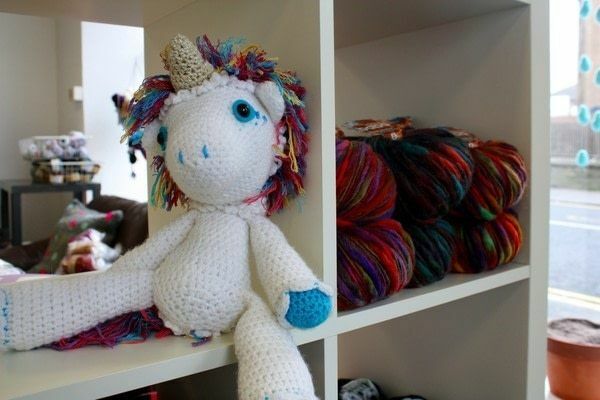 I started out by teaching myself how to knit when i was going through a really low phase during my first degree, i then bribed my Mum to teach me how to do a granny square and from then on i have dragged a yarny project with me everywhere. 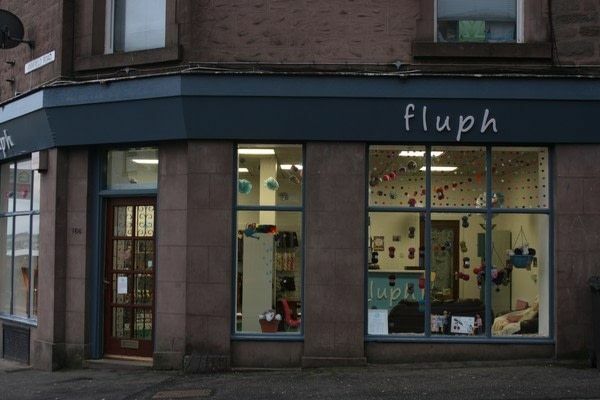 The business sprouted from a passing comment with a tutor, she asked me what i wanted to do when i grew up (i was 23 at the time) and i laughed saying own a wool shop, however as time went on it became more of a real dream and then in December of 2013 fluph opened its doors. We (the royal we) are based slightly out of the city centre up on the Blackness road. I love it up in the West end, its such a fab wee community, everyone chats to everyone, we all look out for each other and enjoy a cuppa together. Dundee as a city has totally captured my heart, its a city which is evolving so quickly, there is a huge creative scene that in the past few years has gown and its just such a nice group of people to know and be involved with. 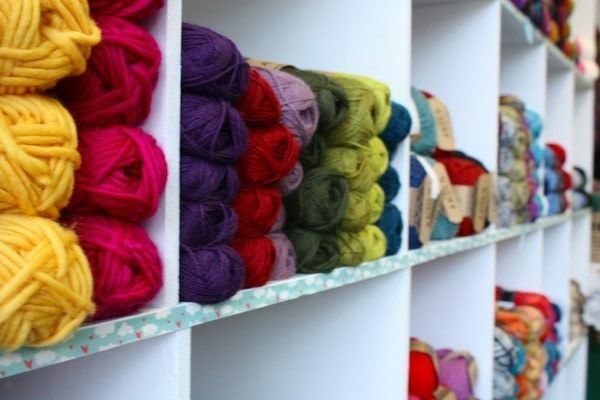 I mostly sell lovely smooshy yarn, I have a huge selection from specialist hand dyed from down in London, to yarn born, bread and spun in yorkshire. We also have a range of yarn hand dyed here in Dundee, alongside a huge selection of needles and notions and patterns from Indie designers. Do you have a particular favorite product that you sell? ohhh thats a difficult questions, its like choosing your favourite child. currently the locally dyed Rusty Ferret yarn, i just finished a beautiful shawl from the most fabulous green. My second favourite is some teeny hand knitted sheep with needle felted faces, so adorable. 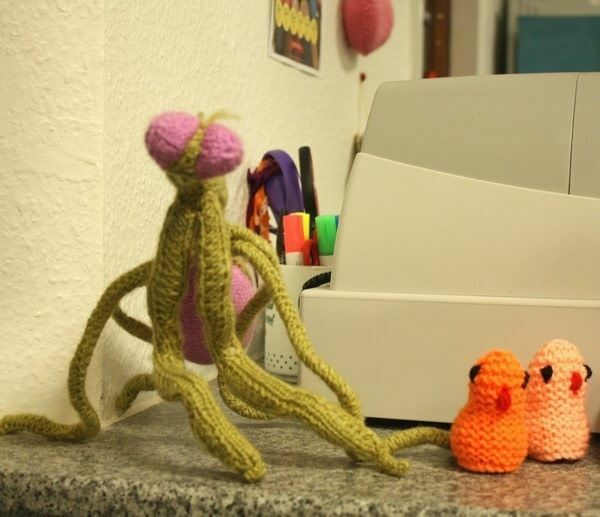 They were made by one of our super talented knit nighters Andrea. i am forever tuned into Team Rock Radio, i was a total goth/mosher when i was a teenager and its something I havn't grown out of it. Currently playing is Nine Inch Nails Closer, Love a bit of Trent. oh my goodness, there is so many things happening in Dundee at the moment, My go to would be Clarkies the 24hour bakery behind the shop, they sell everything! too tempting at lunch time. Of course there are my neighbours Highlander Games for all your card/board gaming/geek needs, and Lapooch dog groomers, i include them as they always have the most adorable dogs in and they sometimes let me sweep the floor! Do you host any workshops, classes or special events? 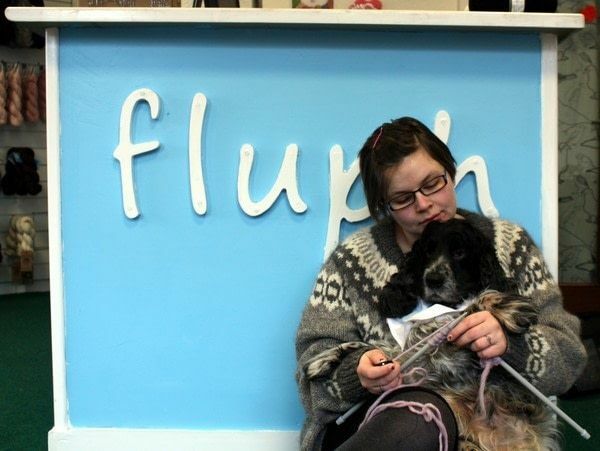 regular events that go on in fluph is our knit night (all crafts welcome) every Thursday evening from 6pm - 8pm. we have plenty tea and biscuits and smooshy seating! We run classes in a block type system, so i am in discussions with my amazing tutors currently organising the next lot, keep an eye on the website under the workshop tab. We also have loads of events going on in the community, we are currently working alongside knitfield to yarn bomb a community centre in Whitfield which has been so much fun, however not enough balaclavas for my liking. Come in and say HI! have a good smoosh, and maybe my doggy general manager will be in for some cuddles too. 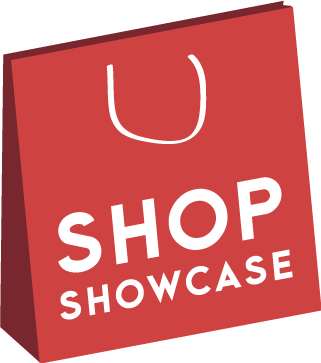 Do you have a favorite craft, art or supply shop in your town that we should feature? Send us a message! I can't wait to pop in the next time I'm in Dundee!